The Dr.Jart Dermask Water Jet Vital Hydra Solution sheet mask is the newest addition to my skincare inventory. I picked it up on sale for $29.99 for a box of 5 sheets at T & T Supermarket (regular price $7.50/sheet at Sephora). What a steal! Before masking, I always exfoliate my skin with the Foreo Luna mini and rinse with warm water then pat to dry. Some may also prefer to apply a toner or booster essence prior to masking. During masking, I recommend lying down as it not only utilizes gravity to help the goodness sink in, but also to creates a peaceful mental space where you can enjoy the present moment and unwire from the day. 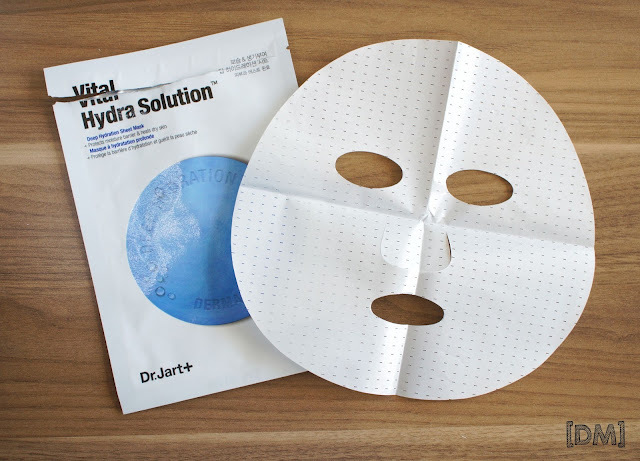 Let's take a closer look at this deep hydration sheet mask. Dr. Jart+ states that the mask is formulated without parabens, sulfates and phthalates. It contains aquaxyl and xylitol to enhance moisture retention and strengthen the skin's barrier by preventing water loss. It also contains oligo-hyaluronic acid and algae extract which supports long-lasting moisturization and natural collagen synthesis. Upon opening the sachet, a sheet mask folded in four can be found drenched in fluidy serum. There is a pleasant, mild floral scent which reminded me of a rose garden. The mask is transluscent, and is adhered to a plastic film, photographed below. I peel off the mask easily from the plastic film and placed it on my face. I carefully expelled air bubbles trapped underneath to ensure good contact. The mask measures approximately 21cm in diameter, and fits the entirety of my face perfectly. As the sheet is made with fine cellulose fibre, it is incredibly soft, smooth and very comfortable to wear for an extended period of time (and this is comparing to my old favourite, innisfree's It's Real! masks). As you can see in the photo below, it really does look and feel like second skin! The sheet mask provided a cooling and calming sensation for at least a good 20 minutes before it began to dry up completely. I massaged in the remaining serum on my face, then left my skin as-is for another 30 minutes to test its effectiveness at providing deep hydration. I'm surprised that the initial hint of stickiness disappeared within 5-10 minutes, and my skin continued to feel moisturized, tender and smooth beyond the half-an-hour mark. 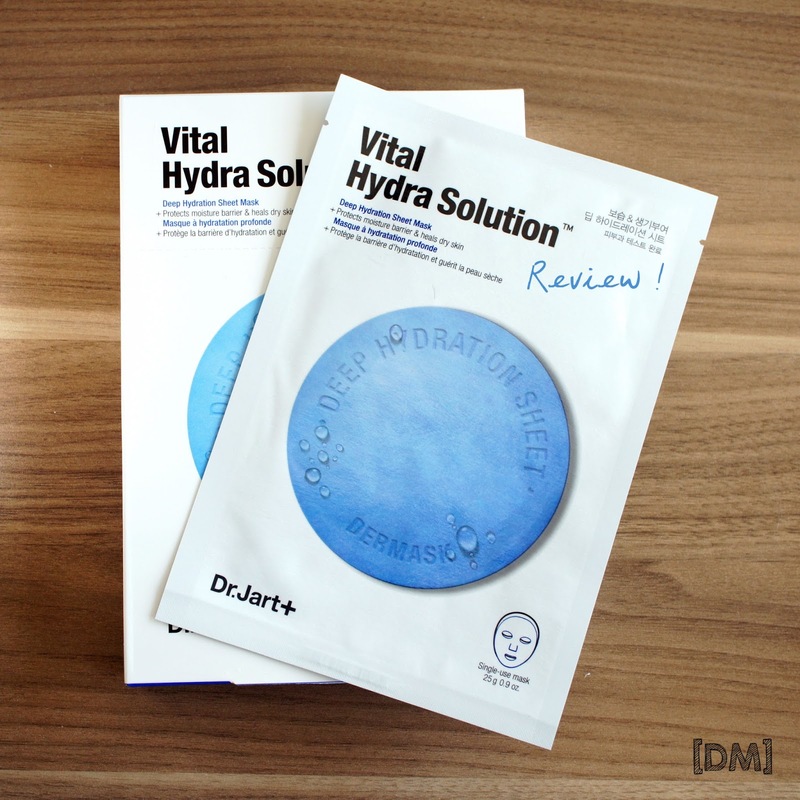 All in all, the Dr. Jart+ Vital Hydra Solution sheet mask is a great find that I will continue to repurchase. It will be helpful in the morning to de-puff and prep the skin for makeup (if time allows), and also as a treatment at night time, followed up by a light face cream and eye cream before sleep. 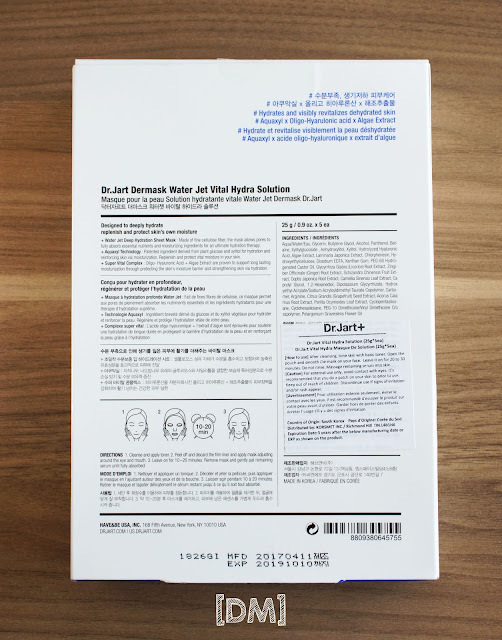 Now I am curious to try some of the other masks from Dr. Jart+ as well, especially the Water Replenishment Cotton Sheet Mask. Have you tried any of the other Dr.Jart+ masks? Which masks do you like to use? Leave me a comment below!